Why is it that hearing someone else’s laugh makes you want to laugh as well? My husband’s best friend’s dad is so funny. He makes me laugh so often. The kind of laughter where you feel it start in the pit of your stomach, bubbling up. Just thinking about some of the things he says makes me smile, and hearing him laugh always makes me laugh even more. My best friend from school always made me laugh to the point where I would be in pain. Laughing so hard that no sound actually comes out. It’s like the laugh gets confused and forgets to come from the back of my throat. With all the good friends and funny friends, you always have a group of friends where you have to fake laughter. These are usually the more annoying acquaintances that you can handle in small doses only. Laughing at their jokes takes little more effort than slightly opening your mouth and doing a bit of a hahaha. My eldest daughter stood in my bedroom this morning laughing in a Mwhahahaha-way. She was playing plants vs zombies on the pc and when I asked her what she was doing, she told me she was practicing her “evil” laugh. So I guess there is that. Just imagine having a group of friends over and bellowing out one of those in casual conversation… Wonder if it would attract their attention? There are many things that can make me laugh involuntarily or at inappropriate times, listening to other people laugh always seems to make me laugh, lack of sleep can also bring on bouts of indescribable laughter. We change physiologically when we laugh. We stretch muscles throughout our face and body, our pulse and blood pressure go up, and we breathe faster, sending more oxygen to our tissues. So laughing is actually healthy, and really, who has ever complained about feeling depressed after a good laughing session. I love how my children laugh so easily. I’ve always been moreso on the serious side and I marvel at how they do that. I hope they never lose that gift and I hope it rubs off on me. Nice post and nice blog! I was in IKEA today and the woman ahead of us had a 3yr old and a baby around one. The 3yr old was tickleing the baby and his laughter was the cutest thing I’v seen in a while. It was really great. 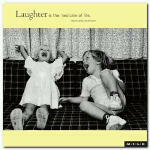 And as regards laughter, I think it’s one of the most important and under-rated necessities of life. Genuine, honest laughs and a good sense of humour are somethings that we all need in order to develop as balanced people who are more happy with themselves.